I was given the unique opportunity to replace the pickups in a Guild Nightbird. This guitar came with Fender HB1 pickups but the owner had managed to get some NOS Guild HB1 pickups in matching gold from the world’s finest purveyor of hard-to-find Guild parts, Hans Moust. When asked if I would do the work to replace them, I jumped at the chance since I love Guilds, I love HB1 pickups, and this guitar was one that I used to own. Not only is this a beautiful guitar (that I was foolish enough to sell), but I knew that it would go from amazing to freaking amazing with the inclusion of Guild HB1s. The Guild Nightbird is a very cool guitar. Yes, it looks like a Les Paul, but it’s hollow with a very unique internal design which makes for a wonderful sound. The problem with Nightbirds is that they usually shipped with Ken Armstrong or EMG pickups which don’t hold a candle to the vintage Guild HB1s in my opinion. I originally bought this guitar because of the lure of real HB1s in a Nightbird, only to be disappointed when I opened it up and found Fender HB1s. I then sold the guitar, after which it was sold again to the guy who I originally bought it from, who then contacted me to see if I would do the work to upgrade the pickups. We Guild collectors tend to work together, so this bit of provenance is only slightly unusual. 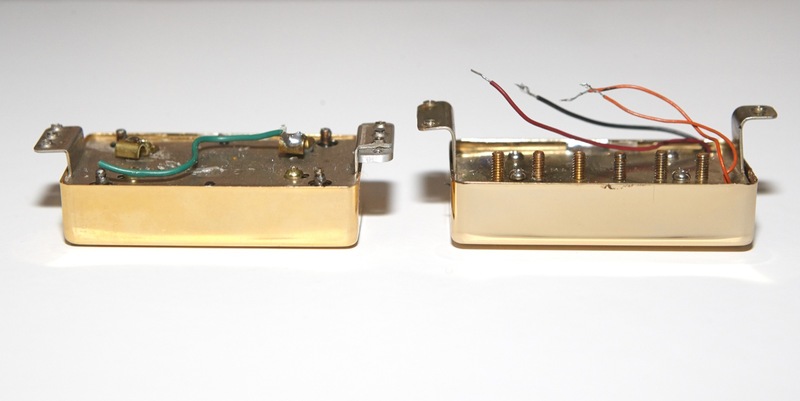 For a dissertation on the differences between the many pickups found in Guild electric guitars, check out my article entitled, Guild Full-Sized HB1 and SD1 Pickup Variations. The Guild Nightbirds that I’ve encountered have come equipped with only a single tone and volume knob, but the tone knob is also a push/pull coil-splitting control. In addition to the normal pickup selector switch, the Nightbird also includes a phase switch. 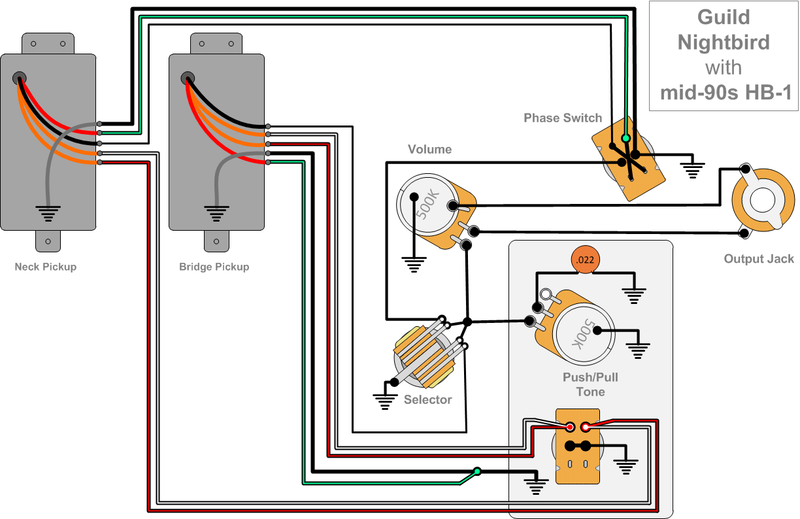 This combination of controls makes for some slightly complex wiring that I didn’t want to disturb, so I set about documenting the layout since I couldn’t find any references online. The drawing to the right shows what I discovered while tracing the many wires in the Nightbird. 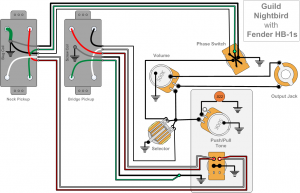 For explanations of the Fender HB1 connections, check out my article entitled Guild Pickup Wiring. The main bit of weirdness I discovered was he fact that the green wire on the bridge pickup was combined with the black ground wire, but this was done inside heat-shrink tubing on the control end which gave the appearance of the green wire starting on the pickup and never coming out the other side. I went nuts trying to trace that wire and finally got out the multimeter and determined that it had been spliced with the ground lead. Another bit of complexity involved the fact that there seemed to be two black wires running to the controls: a thick one (ground) and a thin one (signal). Getting those two right was kind of important, but only if proper function was desired (a little wiring humor, that). Furthermore, there was only one black wire on the pickup side. The thick black wire in the control cavity was actually the ground wire from the multi-conductor cable wrapped in shrink-wrap tubing in the control cavity. Replacing the Fender HB1s with the NOS Mid-90s Guild HB1s involved mapping the existing wiring harness to the new pickups. Being able to solder the pickups was a boon because I would not have to mess with the pots and switches at all. Soldering in a control cavity is never fun, especially in the deep chamber of a mostly hollow Nightbird. One slip and I’d be scorching wood in a $2000 guitar which is something I’d rather not have to explain to the owner. 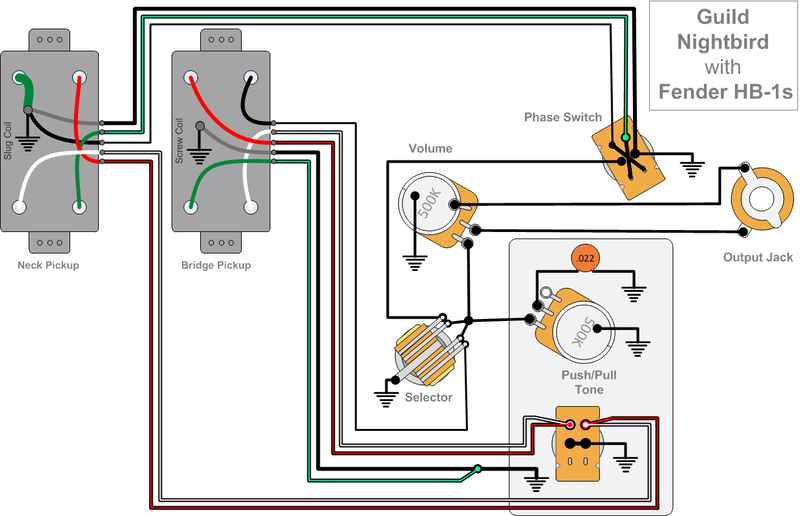 This drawing shows the completed wiring for the Nightbird after putting in the Guild HB1s. The fact that the two inter-coil link leads on the HB1s are the same color was not an issue in this layout since they were wired together at the coil-split control anyway. Since these mid-90s HB1s appear similar (as opposed to 1970’s HB1s that have distinct solder terminals on the bridge pickup), I installed the one with the higher resistance (7.2 kΩ) as the bridge pickup and put the one that measured lower (6.7 kΩ) in the neck position. With all my preparations surrounding the wiring, I’d managed to overlook something that caught me by surprise after I’d soldered all the electronics into place, and after all my careful planning I felt like an idiot for letting it happen. 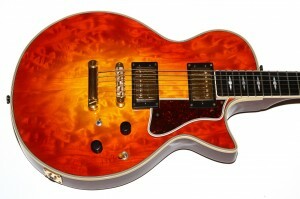 Guild HB1s have substantially deeper mounting wings than do many modern pickups. 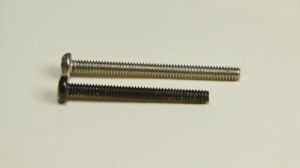 As a result, the adjustment screws included with the Fender HB1s would not allow the Guild HB1s to be lowered sufficiently to prevent them from hitting the strings. 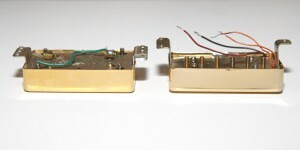 This picture shows a Fender HB1 on the left and a Guild mid-’90s HB1 on the right. As you can see, the pickup bodies are the same height, but the mounting wings are higher on the Guild pickups. I’d known about this depth issue from past attempts to install a vintage HB1 in a non-Guild guitar only to be stymied by the insufficient depth of the pickup route in the guitar. In this case, the Guild Nightbird had plenty of depth, but the adjustment screws weren’t long enough. Pretty much any modern pickup adjustment screw is 1¼ inch long, but the screws in this guitar were only one inch in length. This afforded the opportunity to replace them with gold screws, though, so that’s what we did. So how do the vintage HB1s sound in this guitar? In a word, magnificent. I actually commented to the owner that these pickups make this the perfect guitar. It has beautiful clean tones, raucous growly crunch tones, and creamy high distortion, all with the articulation of boutique pickups and the added fun of coil-splitting and a phase switch. I’ve owned $8000 Les Paul R9s, and this thing crushes them dead with the HB1s in there. And it looks better, too! Subjective hyperbole? Perhaps, but having owned a few Gibson R9s and R8s, I’d push them all out of the way to get to this guitar with its mighty HB1 pickups; it’s just that good. To be fair, this guitar has an ebony fretboard, meticulously crafted details and a very special top. The Guild Nightbird was really a high-end instrument in its day. 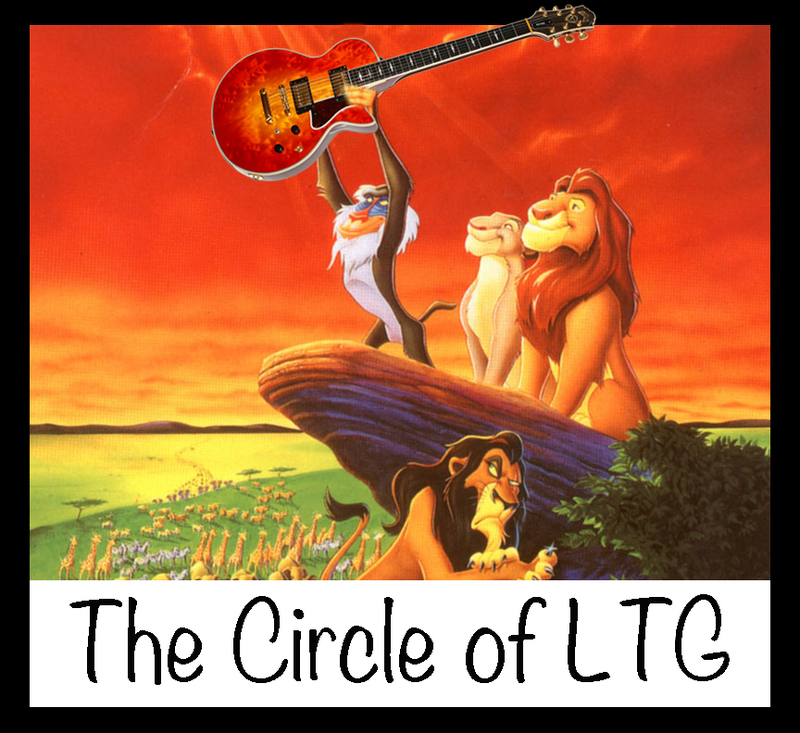 As a final note, we’re all pretty friendly over on the Let’s Talk Guild forum, and working on a guitar for the guy I bought it from who had bought it from the guy I sold it to was funny to me. 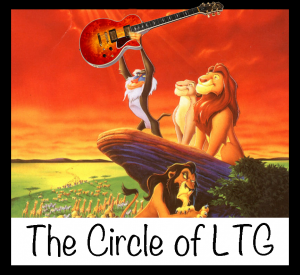 I thought it funny enough that I whipped up this mockery of the circle of life in homage. In addition to the circular nature of this guitars recent ownership history, I was mesmerized by the way the guitar’s top matched the cartoon sunset. This is a truly special instrument, and as much as I’d like to assume that I’ll once more claim it as my own, I have a feeling that the Guild HB1s just make it so great that it will never get sold again. Here’s hoping I’m wrong.